The Bell-Horn OrthoArmor Range-Of-Motion Knee Sleeve supports are designed to give you the comfort of an elastic support with the therapeutic properties of heat, without the perspiration associated with neoprene. 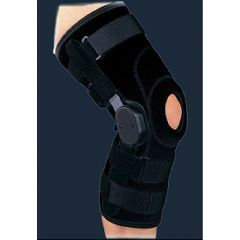 Helps with mild to moderate Anterior Cruciate Ligament (ACL) tears Medial Collateral Ligament (MCL) tears Lateral Collateral Ligament (LCL) tears Combined mild knee instabilities Prophylactic sports protection. I would recommend this product to all. I really enjoy this brace. It is much better than my old brace and it works very well giving the support that my knee needs.